We know the story of Mary and Joseph's journey to Bethlehem for an amazing birth. While the journey's end has been retold with details galore over the years--the simple journey itself has seen fewer narratives. 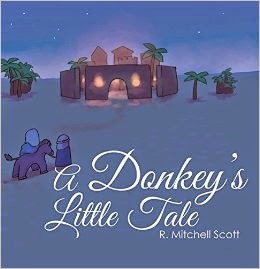 Our family was excited to read and review a lovely children's book from author R. Mitchell Scott: A Donkey's Little Tale. Scott depicts Mary's and Joseph's trek to Bethlehem from a unique perspective: the eyes of their donkey. We wanted to share our review of this story with you today! We also offer you a chance to win a copy of this book in a giveaway (just in time for Christmas!) Enter via the Rafflecopter form at the end of this post. I received a complimentary copy of this book for use in my review. An additional copy is also being provided by the publisher for a promotional giveaway. All opinions are my own. Quick Summary of A Donkey's Little Tale by R. Mitchell Scott. Preparing for the journey to Bethlehem in order to register for the census, Joseph groomed the gentle donkey colt chosen to accompany him and his bride, who was with child. Along the way, the charming little beast of burden committed to memory all he saw and heard along the way in hopes that his intuitive insights and attention to detail would be passed down for generations to come. Little did he realize he would be a witness to the birth of the Christ Child, never dreaming he would be pressed into the service of a King. Thus, the little chronicler fills in many gaps in the love story of Joseph and Mary, and the joyous birth of Jesus. This story is the donkey's little tale. Simple rhymes tell A Donkey's Little Tale. R. Mitchell Scott creates short, rhyming verses with simple illustrations to relay the donkey's tale. Some of the words may be a little difficult for younger children to read alone--but, it's a wonderful story for families to share. A Donkey's Little Tale offers a different perspective. While it may have seemed unfitting for Mary to deliver the Christ Child in a stable; the donkey saw it as the perfect location. Warm, peaceful, calm. He realized that he was quite a fortunate donkey to have participated in the journey. Would I recommend A Donkey's Little Tale? We loved the story as told from the donkey's point of view. He saw the love, the faith--and the simplicity of a very complicated story. A Donkey's Little Tale offers a wonderful, heartfelt perspective families are sure to enjoy. About the Author. R. Mitchell Scott is a native of beautiful Tazewell County in Southwest Virginia, Ronni, whose given name (thanks to Hollywood and the Beach Boys) is Rhonda, shared a name with six other girls in her small high school. Friends call her Ronni, but if you call her Rhonda, she insists she'll have to call you Mother. Ronni is an Air Force veteran, former school and art teacher, and Bible teacher. A passionate artist, Ronni loves the smell of Georgia's Lizella clay, graphite, and oil paint. She believes messy hands are happy hands, be it paint, batter, mud, or chocolate. At age 52, Ronni enrolled at Asbury Theological Seminary's Florida campus, where she earned a master's degree in biblical studies and graduated with honors. She also graduated with honors from Columbus State University, Georgia earning a Bachelor of Science degree specializing in Art. She and her husband have three grown children and three grandchildren. Ronni is blessed to live close to her three little grand buddies, and loves to teach them to do things in non-conventional ways. She thrives on panache, flair, and finding joy in the daily work of just living life. Cooking, baking, eating, painting, sculpting, scavenger hunting, nature walking with her three grand buddies brings joy. She loves to bake and has mastered the art of fudgemaking, assuring her popularity during the holidays. Her grandchildren say Granny makes the best fudge in the world! Ronni is currently writing and compiling stories drawn from a lifetime of personal encounters with the person of Jesus Christ, who came running to meet her in the darkest hours. About the Author R. Mitchell Scott, in honor of her husband and Anglo-Scotch-Irish family tree. A native of beautiful Tazewell County in Southwest Virginia, Ronni, whose given name (thanks to Hollywood and the Beach Boys) is Rhonda, shared a name with six other girls in her small high school. Friends call her Ronni, but if you call her Rhonda, she insists she'll have to call you Mother. Ronni is an Air Force veteran, former school and art teacher, and Bible teacher. A passionate artist, Ronni loves the smell of Georgia's Lizella clay, graphite, and oil paint. She believes messy hands are happy hands, be it paint, batter, mud, or chocolate. At age 52, Ronni enrolled at Asbury Theological Seminary's Florida campus, where she earned a master's degree in biblical studies and graduated with honors. She also graduated with honors from Columbus State University, Georgia earning a Bachelor of Science degree specializing in Art. I would share the book with my two daughters. I would share this book with my granddaughter...she can read it to me. I would share the book with my niece. I want to share the book with my grandchildren. This book would be shared with my niece. I will share this with my cousins! I'd love to share this book with my son! Thanks for the giveaway. I would like to share it with my nephew. I would love to share this with my 4 year old daughter. I would share it with my granddaughter, Victoria!! My niece is just starting to read and is in love with books now. I would share this with her.